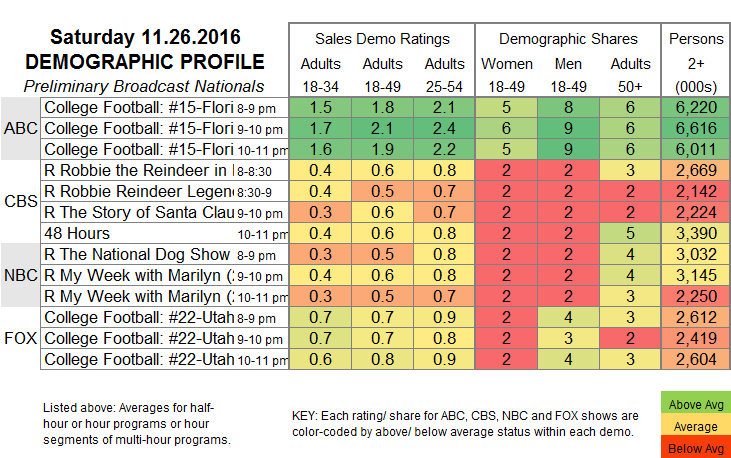 DEMOGRAPHIC DETAIL: For each broadcast program (or hour segment), the chart below displays preliminary key advertiser demographics (adult 18-34, 18-49 and 25-54 ratings), audience skews (women 18-49, men 18-49 and adults 50+ shares) and total viewership (thousands of people over the age of 2). CABLE RATINGS: Come back early Wednesday for detailed demographic ratings for top cable programs from this day, later than normal due to the holiday weekend. "Desus & Mero ratings please?" "Warrior on Cinemax numbers, please."